Here in Michigan for the last 2 1/2 months, it has been so snowy and cold. 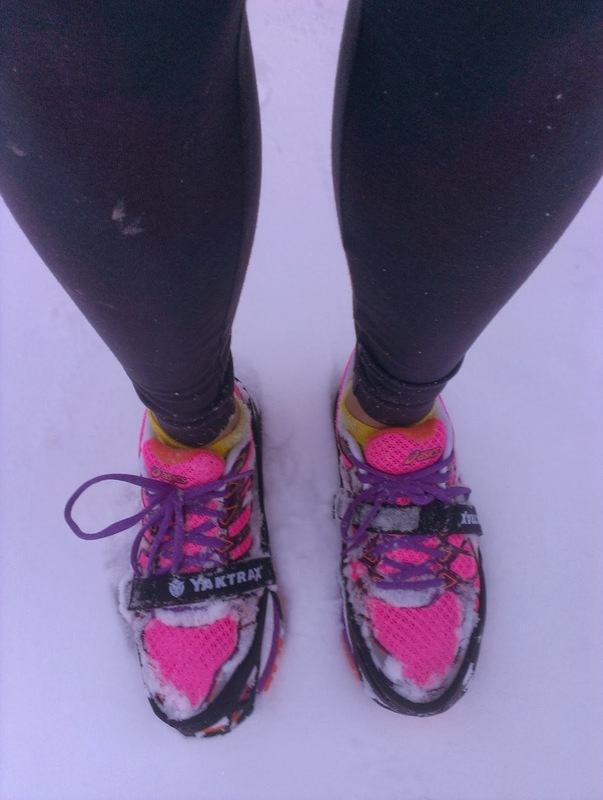 As a runner, I have been trying to not let the cold stop me but it is very difficult. On snowy and icy days, it can be downright dangerous to run outside. One day a couple of weeks ago, it was snowy but I felt the need to get outside and go for a run (cabin fever for sure). I was sent a pair of Yaktrax to try which slip right over your running shoes to give you traction so that you do not fall. They have heavy-duty ice traction coils on the bottom of the Yaktrax for grip. These fit over my shoes perfectly and within a minute, I was ready to go. I cannot believe how awesome these are! I did not slip at all while wearing these. As long as I was in snow that was half an inch, they did not bother me to run with them. In areas with drifts of no snow, they felt funny on the pavement for a second but were not bad. I think that these Yaktrax are an amazing invention to help keep you safe in the winter but still be able to get out of the house and get some exercise. These retail for only $30 which I think is a great price for how much they help you. The giveaway will be for one pair of Yaktrax Pro to one reader.